Automobile manufacturers said Euro-VI grade vehicles will not hit the roads before 2020 but the advancement gives them confidence to make investments in manufacturing such vehicles. The government on Wednesday advanced introduction of ultra-clean Euro-VI grade petrol and diesel in the national capital by two years to April 2018 in a bid to fight air pollution that has reached alarming levels. India had in 2015 decided to leapfrog straight to Euro-VI emission norm compliant petrol and diesel from April 2020 from current Euro-IV grade. While the deadline for the rest of the country stands, for the national capital, which is choking on thick toxic smog, the deadline for introduction of BS-VI - equivalent to Euro-VI grade, has been preponed to April 2018, the petroleum ministry said in a statement. Delhi consumed 906,000 tons of petrol and 1.26 million tonnes of diesel in 2016-17 and meeting that requirement from April next year would not be a problem. "Taking into account the serious pollution levels in Delhi and adjoining areas, the petroleum ministry in consultation with public sector oil marketing companies has decided for preponement of BS-VI grade auto fuels in the national capital territory of Delhi with effect from April 1, 2018 instead of April 1, 2020," it said. 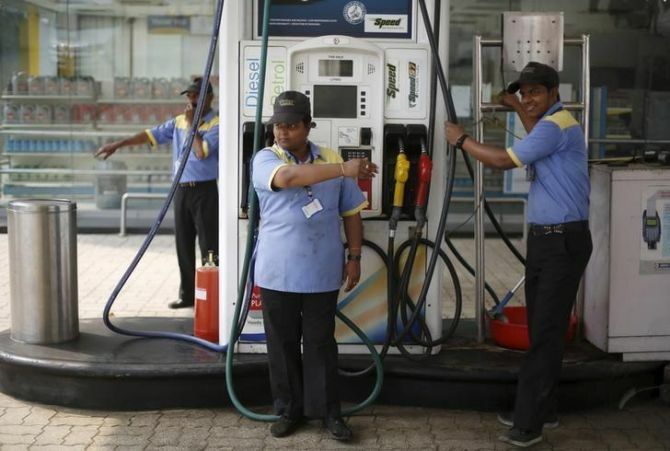 Fuel retailers have also been asked to examine the possibility of introduction of BS-VI auto fuels in the whole of national capital regions, which also includes adjoining cities of Ghaziabad, Noida, Gurgaon and Faridabad, from April 1, 2019. In a Twitter post, Oil Minister Dharmendra Pradhan said "the decision to prepone the introduction of BS-VI grade fuel in NCT of Delhi w.e.f. 1st April 2018 in place of 1st April 2020 as a sincere effort to curb vehicular pollution in Delhi and adjoining areas." "Migration to BS-IV grade fuels shows India’s resolve to cut down emissions," the statement said. "As a next step in this direction, the government in consultation with stakeholders has decided to meet international best practices by leapfrogging directly from BS-IV to BS-VI grade by April 1, 2020, skipping BS-V altogether." Oil refineries will need to invest Rs 28,000 crore in upgrading petrol and diesel quality to meet cleaner fuel specifications by 2020. Welcoming the initiative, Abhay Firodia, president, SIAM said the early introduction of BS VI fuel gives confidence to the auto industry that BS VI fuel will be available across the country from April 1, 2020, when the auto industry will fully migrate to manufacturing only BS VI compliant vehicles on a pan India basis. Availability of BS VI fuel in Delhi from April 2018 also gives an opportunity to vehicle manufacturers in this region to test and validate the BS VI vehicles being developed by the auto industry so as to be fully ready for the April 2020 deadline, he said. Mahindra & Mahindra managing director Pawan Goenka said it was unlikely that automobile manufacturers would be able to bring Euro-VI vehicles by next year. "I don't foresee any mainline player with multiple models being able to launch complete portfolio of BS VI compliant vehicles by April 2018," he said. According to Indian Oil Corp (IOC), for petrol engines, one of the most critical specifications is Research Octane No (RON), which has improved from 88 in BS-II to 91, which is at par with regular 91 octane gasoline (petrol) required for Euro VI emission norms. Previously, the fuels meeting Euro IV or Bharat Stage (BS) IV specifications were to be supplied throughout the country by April 2017 and BS V or Euro V grade fuel by April 1, 2020. Is Piyush Goyal reversing Suresh Prabhu's legacy?